Hammacher and Schlemmer is continuing on with their quest of creating gadgets that you wish you knew why you needed. This gadget might actually be one that you attempt to justify paying the hefty price tag for, just purely because it’s a cool gadget. Despite that I haven’t the faintest idea why it’s necessary. 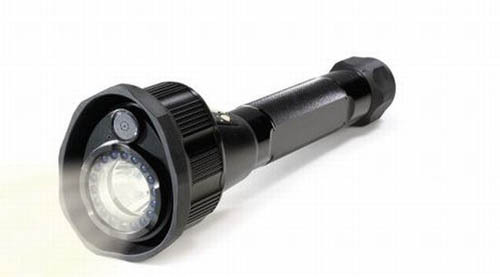 This flashlight claims to be the absolute and only Infrared Flashlight Video Recorder. It might very well be, I know I’ve never seen another of its kind, but then I can’t manage to see everything there is to see on the internet. As much as I wish I could and still attempt to anyway. The flashlight features a 3-watt cool white LED light as the main light and then 17 infrared LEDs that surround that main light. With those extra LEDs it can illuminate up to 13′ for all that late night recording. The flashlight will support up to a 2GB mini-SD card and also has 128MB of built-in memory. The video and snapshots are captured at 640 x 480 resolution at 30 fps. If you want to use the built-in memory, you’ll be able to store 15 seconds of video and 500 quick snapshots. It also features a microphone (for sound) and an LCD screen (to show you details such as battery life). It takes 3 C batteries to keep the light running for 3 hours. You can pick it up for $399.95. The camera – high powered flashlight was originally ordered by a company in the Philipines for their security gaurds to quickly spot and record any illegal activity for evidence and enforcement in their legal system. It’s got other uses, but this is a great idea for police,and security staff.